The origin of Kannada language, also known as kannarese, can be traced to the early Christian era. Kannada is one of the most well known Dravidian languages of India. It is as old as Tamil, the truest language of the Dravidian family. 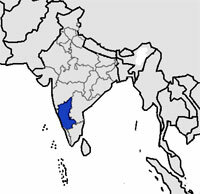 It is spoken predominantly in the state of Karnataka in India (one of the four southern states in India), though a significant number of Kannada speaking people can also be found in the other states. A good number of people speaking this language who have migrated from India live in other parts of the world such as USA, UAE, Singapore, Australia, UK, etc. It stands in the 27th place of the most spoken language in the world and there are about 35 million Kannadigas (Kanadda speaking people) in the world. It is one of the official languages of the Republic of India and the official and administrative language of the Indian state, Karnataka. The earliest inscriptional records in Kannada are from the 6th century. Kannada script which is closely similar to Telugu script in origin. Kannada has a number of regional and social dialects and has marked distinctions between formal and informal usage. 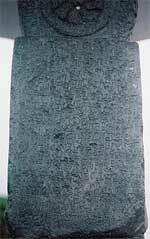 Kannada script originated from southern Bramhi lipi of Ashoka period. With time, it underwent so many changes in the reign of Sathavahanas, Kadambas, Gangas, Rastrakutas, and Hoysalas. A mixture of Telugu-Kannada scripts has been used in Kadambas of Banavasi and the early Chalukya of Badami inscriptions in the west even before the Seventh Century. In the middle of the seventh century a new variety of the Telugu-Kannada scripts was developed. Only in the 13th century, the modern Kannada and Telugu scripts were developed. Other languages like Konkani, Kodava and Tulu use only Kannada script. The early development of the Kannada language was independent of the Sanskrit influence. However during later centuries, Kannada, like the other Dravidian languages was greatly influenced by Sanskrit in terms of vocabulary, grammar and literary style. As such, Kannada shares a large number of structural features with other Indian language scripts. The writing system of Kannada script includes the principles that governs the phonetics and is a system of syllabic and phonemic writing. The earliest inscriptional records in Kannada are from the 6th century. We can not determine the origin of Kannada literature from early (pre 800 AD) pieces of work available now. The oldest extant book is king Nripatunga's literary critique Kavi Raja Marga (around 840AD). Jainism was a popular religion at that time and there were some Jaina poets like Srivijaya and Guna Varman. During the 10th century, a new tradition by mixing prose and verse with the campu (an Indian verse form) style was introduced. The poets Pampa, Ponna and Ranna, known as the Three Gems of Kannada literature , extensively wrote on episodes from the Ramayana and Mahabharata and Jain legends and biographies. Then Chavunda Raya wrote the history of all the 24 Jaina tirthankaras (saintly teachers). Around the 11th century, Kannada literature experienced a setback due to invasion from Tamil kings and only a few literary works could be seen done in this period. The inscriptions of this period illustrate many variations of meters and structural variety. These inscriptions are a wealth of information for historical data, cultural life and study of Kannada language and literature of early times. In the second half of the 12th century, Jainism was on decline and puranic Veerashaivism was gaining grounds. In the wake of veerashaiva theosophy, a very distinct phase of writing began to gain importance. A spate of literary works in praise of Lord Shiva from famous writers like Harihara, Raghavanka and Kereya Padmarasa, emerged during the 12th and 13th centuries. The Poetess Akkamahadevi is known for her bhakti poetries. However she has advocated strongly against the religious rituals. In the meantime the Jains, too came out with legendary histories of various tirthankaras (propagators). A comparative study of contemporary religions has been done by Samayaparikshe of Brahmasiva ( c. 1150 A.D.) with his emphasis on the superiority of Jainism, the religion he followed. He is a bitter critic of all the other sects and their beliefs. The development of poems, literary criticism, grammar, natural science and translations from Sanskrit literary works is the highlight of the 13th century. Eminent poets like Bhima Kavi, Padmanaka, Mallanarya, Singiraja and Chamarasa lived in the realm of Vijayanagara kings and have made invaluable contribution to the Kannada literature with their bhakti poetries. The Bhakti movement lasted till the 16th century. The Ramayana, Mahabharata and Puranas were translated afresh using the folk meters, satpadi and regale. Dasa Sahithya, devotional songs of dasas (slaves of the Lord) sung in praise of God, were compiled, which formed an important part of popular literature. 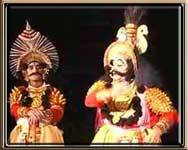 Dramatization of Puranic tales named Yakshagana in musical form, was a novel tradition of late 18th century and this tradition paved way for a number of celebrated creations of folk poetry. Till late 19th century there was a lull in Kannada literature. Works based on Sanskrit models, like Shakuntala of Basavappa Shastri continued till the late 19th century. The Christian missionaries put in some efforts with which the Academy of Kannada Literature was set up in Bangalore in 1914. Gradually, so many translations were made from English, Bengali and Marathi literature. Apart from the pioneers of novel writing, Kerur and Galaganatha, Shivarama Karanta, K. V. Puttapa, G P Rajaratnam, Basavaraja Kattimani and Nanjanagudu Tirumalamba (the first major woman writer in modern Kannada) are some more eminent novelists worth mentioning. Nanjanagudu Tirumalamba is the first major woman writer in modern Kannada. Short story writers such as Panje Mangesha Rao and Masti Venkatesha Ayyangar made entry in this period. Kannada poetry soared to a new height with innovative poets like B. M. Shrikanthayya. Institutions like University of Mysore, Kannada Sahitya Parishad, etc. are doing a commendable job in pushing the Kannada literature further.